Imagine a 4 by 4 by 4 cube hanging in front of you with just the front face facing you. The cube is made up of 4 x 4 x 4, 64 cubes. You drill holes through the four corner cubes, that are facing you, all the way through to the back. You and your friend examine all the 64 small cubes. You need to find out how many small cubes have holes in them and how many have no holes in them. Please justify your findings to someone else! Then look at how many small cubes have two holes and how many just one hole? Instead of drilling in the corners, a 2 x 2 square in the middle of the face is chosen and these are drilled through to the back. The person looking from above also chooses the middle part of the face and drills through these to the bottom. You and your friend examine all the 64 small cubes. You need to find out how many small cubes have holes in them and how many have no holes in them. Again the challenge is to work out how many small cubes have holes and how many do not have holes. Then look at how many small cubes have two holes and how many have just one hole? - and between different sizes of cubes. Why stick to corner drilling and central square drilling? 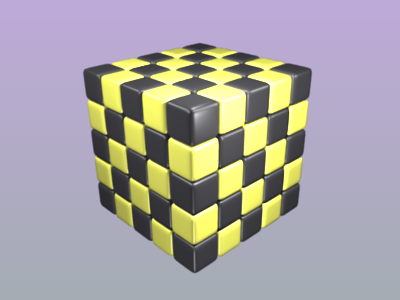 Consider large cubes made up of black and yellow cubes in a chess board type pattern. Visualising. Generalising. Interactivities. Cubes & cuboids. Squares. 2D representations of 3D shapes. Mathematical reasoning & proof. Working systematically. Creating and manipulating expressions and formulae. Games.